May Jesus always be the pilot of the little boat of your spirit. May Mary be the star which lights the path for you and shows you the surest way to reach the Heavenly Father. At the end of each day, Padre Pio and his fellow Capuchins gathered together in the church for evening prayers. After the Rosary, they would pray St. Alphonsus de Ligouri’s prayer, the “Visit to Jesus in the Blessed Sacrament” and the “Visit to Our Blessed Lady.” Often Padre Pio’s voice was broken by sobs as he recited the beautiful prayers to Jesus and Mary. The Novena to the Sacred Heart of Jesus followed and was prayed for the intentions of all who had requested prayers. After the evening prayers, the members of the Capuchin community went to dinner in the refectory. Padre Pio, who had only one meal a day, at noontime, remained in the church to pray. When Padre Pio finally retired to his cell at night, one or two of the Capuchins would usually stop by to bid him goodnight. They would always recite a Hail Mary together before parting. Padre Pio kept a Rosary on the table by his bed and one under his pillow, always close by and ready for use. One evening Father Carmelo stopped to visit Padre Pio in his cell. Padre Pio told Father Carmelo that he was going to say several more rosaries and then go to bed. “How many rosaries have you said today?” Father Carmelo asked. Because Father Carmelo was his superior, Padre Pio felt obliged to answer. “I have prayed thirty-four rosaries today,” Padre Pio said. Padre Pio had a tender devotion to Our Lady of Pompeii and he prayed the novena to Our Lady of Pompeii throughout his life. A beautiful shrine that is dedicated to Our Lady of Pompeii is located in southern Italy, near the ancient city of Pompeii. The shrine was founded by the great friend of God, Blessed Bartolo Longo. After a dramatic conversion back to his faith, Bartolo became a Third Order Dominican and took the religious name Fratel Rosario (Brother Rosary) in honor of the Rosary. He dedicated the rest of his life to spreading devotion to the Virgin Mary. 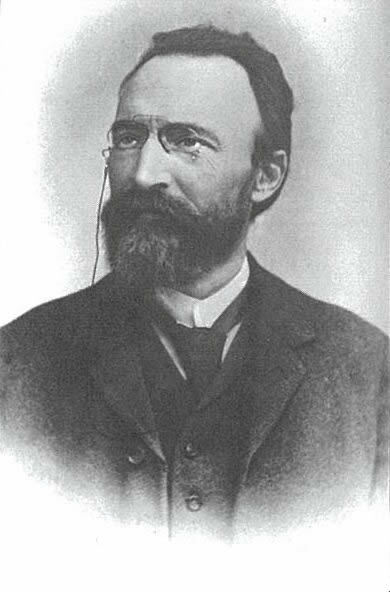 Blessed Bartolo Longo, often called the Apostle of the Rosary, dedicated his life to spreading devotion to the Virgin Mary. Padre Pio had the highest esteem for him and corresponded with him. On one occasion, Bartolo was given a painting of the Madonna. The painting was in very poor condition for through the years it had become stained and torn in places. Bartolo decided to have the painting refurbished. He wanted to build an altar in the parish church and place the painting of the Madonna on it. He requested permission from the bishop. The bishop told Bartolo that what was needed much more than an altar was a larger church. He asked for Bartolo’s help and he agreed to do whatever he could to assist the bishop. After much hard work, Bartolo completed the building project. He had the painting of the Madonna restored to its original beauty. Jewels were embedded into the painting as well as a crown which was placed on the Madonna. The image was put on a special altar in the new church. Bartolo realized that there was something altogether unique about the painting, something which, as he said, “impressed the soul.” And it was true. Visitors to the new shrine, upon seeing the image of Our Lady of the Rosary, knelt down and began to pray. The painting came to be known as the Madonna of Pompeii. Soon cures and favors were reported by those who prayed before the painting. One of the first reported miracles was the complete healing of Bartolo’s own mother, who had been on her deathbed. Bartolo decided to document the favors that were being received and it was not long before he had recorded more than 900 miracles. Bartolo also composed a novena to the Virgin of Pompeii which became widely circulated. As the word spread, more and more people had the desire to visit the shrine of Our Lady of the Most Holy Rosary in Pompeii and it became the destination of thousands. Bartolo Longo was beatified on October 26, 1980 by Pope John Paul II, who called Bartolo the “Apostle of the Rosary.” Pope John Paul II had made a visit to the shrine of Our Lady of the Most Holy Rosary in Pompeii one year before he declared Bartolo blessed. The Holy Father returned to the shrine in 2003 to pray for world peace. More than four million people visit the shrine each year. Padre Pio made a number of pilgrimages to the shrine of Our Lady of the Most Holy Rosary in Pompeii. When he was fourteen years old, he traveled there with seven of his classmates and his teacher, Angelo Caccavo. He also made several visits to the shrine after his ordination to the priesthood. He had a great admiration for Bartolo Longo and on one occasion he sent him a holy card on which he inscribed on the back, “For Bartolo Longo – May Mary always look down on you with a maternal eye and comfort you in your afflictions.” Bartolo once wrote a letter to Padre Pio asking for his advice on a personal matter and Padre Pio wrote back to him, offering his spiritual counsel. It was the Virgin Mary who came to the aide of Padre Pio and assisted him in the many trials of his life, including the times when he was attacked and tormented by the devil. One night in 1964, the superior of the monastery was awakened by a terrible noise coming from Padre Pio’s cell. When he rushed to see what had happened, he found Padre Pio lying on the floor. He was bleeding from a gash on the right side of his face, above his eyebrow. His face was swollen and there were black circles under his eyes as though he had been punched. Bruises were observed on his shoulders. Underneath his head was a pillow. When the superior asked Padre Pio what had happened, he said that the devil had come in his cell and attacked him. The superior asked him who had put the pillow beneath his head and he replied, “The Madonna.” She had taken it from his armchair and placed it under his head. Padre Pio was unable to celebrate Mass for one week while recuperating from his injuries. The superior decided not to disclose the full facts of the story to the public. The people in San Giovanni Rotondo were told simply that Padre Pio was unable to say Mass because he had fallen out of bed and injured himself. Right before this assault, Padre Pio had been praying intently for a woman who was in great need. She was believed to have been a victim of diabolical possession. I can see him today as he appeared to me when I was a youngster. It was beautiful to see him there in the silence of his cell when we Capuchin aspirants went to him for confession. The dim light gave a mystical touch to his emaciated but radiant countenance. Near him was a photograph of his mother who had died a short time before, and a little statue of Our Lady. He spoke about her to us and taught us to love her. At a certain hour he used to walk in the friary garden, absorbed in his sufferings and his love while the beads slipped through the fingers of his wounded hands. And how full and ardent was his voice when he recited the Angelus with the others, in the garden, in the choir or at the window. Who could fail to be moved by the sight of him as he walked with painful steps toward the altar for evening devotions and in a voice breaking with emotion recited the Visit to Our Blessed Lady. The Bishop of Foggia, Most Reverend Msgr. Paolo Carta shared a close friendship with Padre Pio and visited him on a number of occasions. One day he invited the Auxiliary Bishop of Pisa, Italy, Most Reverend Msgr. Antonio Angioni, to accompany him to San Giovanni Rotondo to see Padre Pio. He assured Msgr. Angioni that if he accepted the invitation, it would be an experience he would cherish for the rest of his life. Msgr. Angioni agreed to go. At the moment of our arrival, the priest was reciting the prayer to Our Blessed Lady. As I have said, we didn’t see him, but in the mystical silence of the little church, his voice reached us clearly and distinctly . . . That voice was so striking as he recited the prayer in vibrant and moving tones that it caused Msgr. Angioni to marvel. He turned to me and asked, “Who is reciting the prayer?” to which I replied, “Padre Pio.” How well Padre Pio prayed. One felt that he put his whole heart into it, his whole soul, his whole self . . . Msgr. Angioni, who is blessed with a delicate spiritual sensitivity, was at once aware of something exceptional, something extraordinary. It was the intense vibration of a soul filled with faith, the sweet outpouring of a heart full of love for Our Lady. Padre Pio pronounced each word very distinctly and in such tones as to touch the hearts of all present, even to the point of tears. In April 1959, the Pilgrim Virgin statue of the Madonna was taken from the shrine in Fatima, Portugal to visit a number of the provincial capitals in Italy. Foggia, not a great distance from San Giovanni Rotondo, was one of the cities where the statue of the Madonna was going to stop. Bishop Carta, was very happy that the Pilgrim Virgin would be making a visit to his diocese and was preparing the citizens of Foggia for the time of her arrival. Padre Pio had become ill with a serious case of pleurisy about the same time that the Pilgrim Virgin statue left Fatima. Because he had a great desire to see the image of the Madonna, a change was made in the schedule and San Giovanni Rotondo was added to the itinerary. Due to his illness, Padre Pio was unable to say Mass or hear confessions and was growing weaker by the day. He had to endure a number of painful procedures whereby the fluid was drained from his lungs. The superior of the monastery, alarmed at his condition, called in a number of specialists to examine him. Four doctors diagnosed Padre Pio as having a cancerous tumor on his lung but Padre Pio was not convinced of it. More than once he was admitted to the hospital, the Home for the Relief of Suffering, but he was always anxious to return to his religious community. He said that he did not want to die in the hospital. He wanted to die in the monastery. Our hearts are trembling for the arrival of this Mother. Why is she coming? Because she wants to visit her children. Therefore, it is an act of love. Therefore, let us prepare to empty our hearts of all that is neither of God, nor connects with God, nor leads to God. And this is the best welcome we can give to this celestial Mother. To keep something back is not worthy of a child in front of a Mother that is offering all of herself. This visit should not be limited to simple enthusiasm, but must remain permanent, as our Mother’s eye is permanently on us. Let us renew often the resolutions which we have made on this day of our celestial Mother’s visit. When the Pilgrim Virgin statue arrived in San Giovanni Rotondo, Padre Pio was in bed. He had been bedridden for more than three months. The statue was taken to the church of Our Lady of Grace. For this occasion, the church remained opened day and night. Padre Pio was brought to the sacristy in a wheelchair. He kissed the image and placed a gold Rosary in her hands. Because of his extreme weakness, he had to be taken immediately back to his bed. Afterward, the Pilgrim Virgin image was taken through all of the wards of the Home for the Relief of Suffering. When the statue was leaving San Giovanni Rotondo, a huge crowd assembled in the square outside the church to bit her farewell. Padre Pio, too, wanted to view her departure so he was taken to the balcony of the church. As a farewell gesture to Padre Pio, the helicopter that was to carry the statue to Sicily, circled three times around the church before leaving. As Padre Pio watched from the window, he was overcome with sadness and he began to cry. He prayed, “Dear Mother, when you came to Italy, I became sick. You have visited me here and I am in the same condition. Now you are leaving. Will you not give me your blessing and heal me?” At that moment a sensation of warmth and a kind of shudder ran through his entire body. All at once he felt completely well and had the desire to walk and to exercise a bit. The next day he wanted to celebrate Mass but his superior did not think it was advisable. That evening a doctor examined him and declared that he was well and could celebrate Mass the following day and resume all of his normal activities. After the Pilgrim Virgin statue left Italy, an article appeared in the newspaper voicing a complaint. Someone wrote that it would have been preferable if the Pilgrim Virgin had traveled to Monte Sant Angelo, to the well-known shrine dedicated to St. Michael the Archangel, rather than to San Giovanni Rotondo. 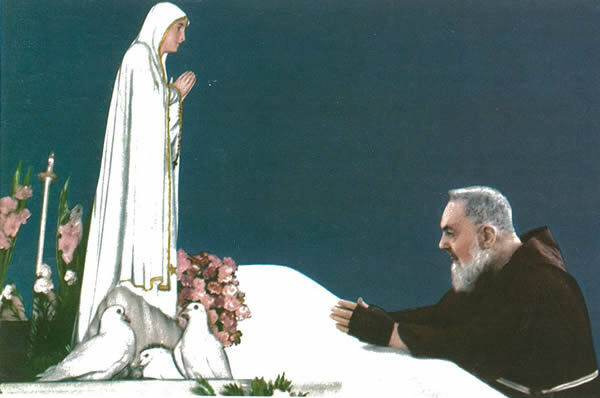 When the article was brought to Padre Pio’s attention, he said simply, “Our Lady came here because she wanted to cure Padre Pio.” He told many people about his miraculous healing through the intercession of Our Lady of Fatima. His eyes always filled with tears whenever he talked about it. May Our Lady of Grace who is the Queen to whom every day and many times in the day we manifest our love, and of whom we ask her maternal assistance, reign always in the city that will rise here and may she assist all of you. May the Madonna intensify the love of her children for the Vicar of Christ on earth, and one day may she show us Jesus in the splendor of his glory. William (Bill) Martin from Brooklyn, New York first met Padre Pio when he made a trip to San Giovanni Rotondo in 1959. Bill visited Padre Pio again in 1964 and when it was time to say goodbye, Bill found it very difficult to leave. As he was waiting for the bus to take him to Foggia, one of the members of the Capuchin community came running toward him and told him that Padre Pio wanted him to stay on at the monastery. Bill was overjoyed at the news. He became a Third Order Franciscan and was thereafter known to everyone as Brother Bill. After Padre Pio’s death, he was ordained to the priesthood and took the name Father Joseph Pius Martin. 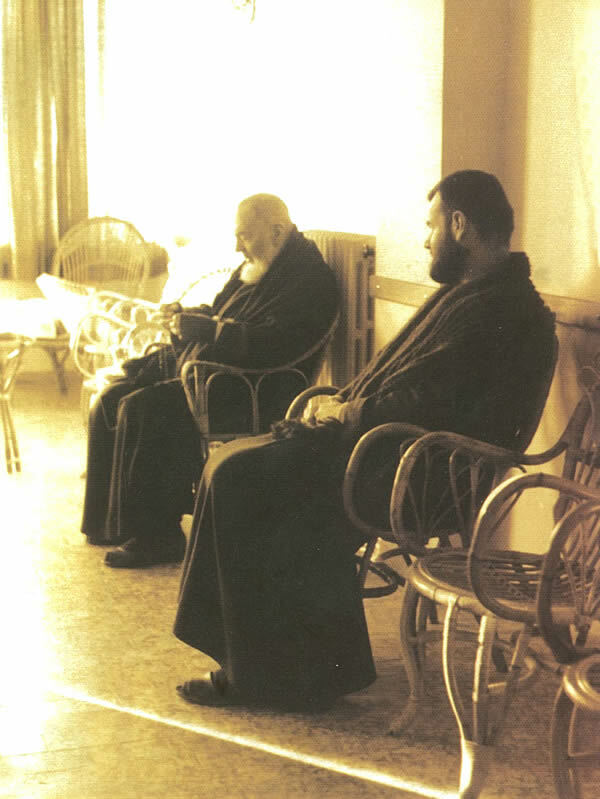 Brother Bill Martin (Father Joseph Pius Martin) sitting on the veranda with Padre Pio sharing a quiet moment. Toward the end of Padre Pio’s life, the burdens of old age and ill health weighed on him. He suffered not only from the pain of the stigmata but also from exhaustion, weakness, severe headaches and many other physical ailments. Subject to asthma attacks, it was often difficult for him to breathe. In the last three years of his life, his fellow Capuchins noticed that he became more and more silent. When he had company, if the conversation of his visitors turned to small talk or idle chatter, he would quickly put a halt to it. When people approached him seeking his counsel, often, rather than speaking, he would simply hold up his Rosary, encouraging prayer as a solution to the trials and difficulties of life. In his last years, his greatest consolation was the Rosary, which he prayed night and day. Just four days before his death, Padre Pio expressed his devotion to Mary in one of his final gestures of love. A man brought Padre Pio a beautiful bouquet of red roses for the occasion of the fiftieth anniversary of his stigmata. Padre Pio took one of the roses out of the bouquet and asked one of his spiritual sons who was going to Pompeii if he would take it to the shrine of Our Lady of the Holy Rosary. The man promised that he would take it there the very next day. When the man arrived in Pompeii, he told a nun who served at the shrine that the rose had been sent by Padre Pio, who asked that it be placed before the image of Our Lady of the Rosary. Very pleased to receive the rose, the nun placed it in a vase with other roses. On September 23, the day that Padre Pio passed away, the nun noticed that all the other roses in the vase had withered but the one that Padre Pio had sent was still fresh and beautiful. The news of Padre Pio’s unfading rose reached the local bishop who decided to put it on display in a special glass container. Padre Alberto D’Apolito, who had been very close to Padre Pio through the years, heard about the rose and wanted to see it. He took a number of Third Order Franciscans from San Giovanni Rotondo on pilgrimage to the shrine in Pompeii. They saw the rose that Padre Pio had sent to Our Lady of Pompeii and although the stem was slightly yellow in color, the rose remained fresh and intact. Their visit to see the rose occurred one year after Padre Pio’s death. The Rosary was the most beautiful and longest sermon in honor of her, because it lasted the whole of his life. He spoke with the Rosary which he was seen to clutch always in his fingers, the Rosary he clutched in those last instants, almost as though it were the supreme link between the earth he was about to leave and the heavens which opened before him. Padre Pio passed into eternal life very peacefully, very well prepared. He died with his Rosary in his hand. His last words were – Jesus, Mary.